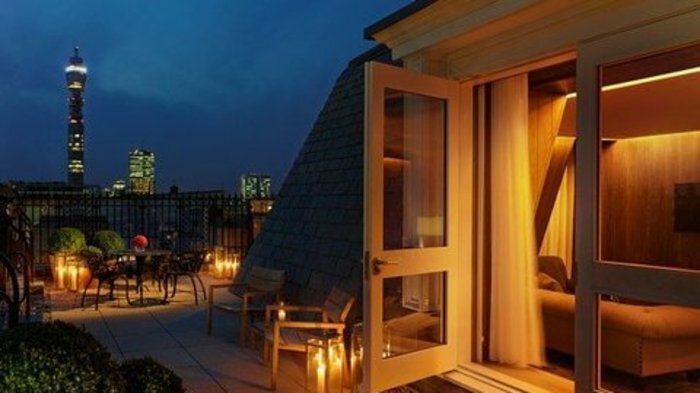 Part of legendary hotelier Ian Schrager's hotel brand, which boasts nine hotels worldwide, the London EDITION has transformed an iconic landmark building into a charismatic, modern and dynamic hotel. Part of the EDITION brand, this hotel combines charisma and ease. The London EDITION has all the hallmarks of the EDITION brand: lasting comfort, extraordinary style and an exceptional level of service in a uniquely individual environment. Located in central London's Fitzrovia, The London EDITION brings together, in a delicate balancing act, the integrity and character of a historic building with a simple, sophisticated design sensibility, creating a seamless blend of charisma and ease. With 173 rooms, a restaurant, two bars, a dance club, meeting rooms and a buzzing lobby, the hotel offers a dynamic social hub where guests and visitors can work, relax, socialize and dine all under one roof. Jason Atherton's restaurant served modern British food using the best ingredients available. This striking bar ensures guests are welcomed to the hotel with suitable grandeur. Ensuring guests at the London EDITION hotel are greeted with suitable grandeur, the Lobby Bar boasts a striking high stuccoed ceiling with a gargantuan stainless steel egg sculpture by German industrial designer Ingo Maurer at the centre. Aiming for 'organised chaos', it brings together an eclectic mix of furniture and iconic British and European design. Intimate seating areas are juxtaposed with a Donald Judd inspired black walnut communal work table outfitted with Apple desktop computers and outlets for personal laptop use, making the space appropriate for both work and play. The cocktail list has been created by drinks manager Davide Segat and includes the signature EDITION Shrub, the Elderflower Power Sour and the Hoax Martini. Sup on punch served in a miniature cauldron at this intimate reservations-only bar. Specialising in punches served from miniature cauldrons, the Punch Room is an exclusive reservations-only bar tucked away at the back of the hotel. As well as the brash and lavish style that Ian Schrager is famed for, he also specialises in intimate areas such as this. The fumed-oak panelled den is inspired by the comfort of manor house libraries and nineteenth-century London private clubs, reincarnated with a modern twist. Drinks are designed for sharing, with options for two, four, six or eight people. The range of speciality punches include the gin infused EDITION Punch with jasmine tea and oak moss, which can be enjoyed while listening to a soundtrack of vintage soul, ragtime, ska and blues. With state-of-the-art equipment, the gym is open 24-hours a day. Accessible 24-hours a day, the London EDITION's Fitness Centre has state-of-the-art fitness equipment, including cardiovascular machines with personal flat screens TVs. There is also a free weight and stretching area as well as complimentary towels, headphones and refreshments, and personal training sessions, which are available upon request. From cheap budget accommodation to luxury 5 star suites see our discounts for hotels, including Holiday Inn Oxford Circus from 60% off.